The world’s biggest flying bird—the Sarus Crane, with a maximum of height of 6 feet/1.8 meters—has had a rough go of it. Due to habitat encroachment and environmental degradation in its traditional home base of Asia, the bird’s worldwide population has dropped to roughly 20,000 individuals, marking it as a Vulnerable species. 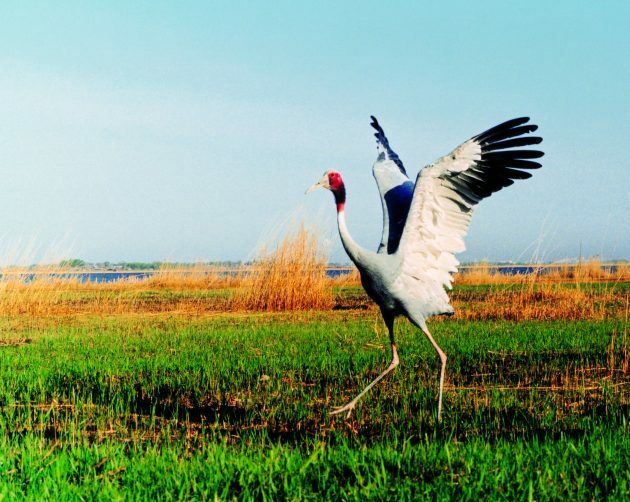 But the International Crane Foundation—with the support of some Thai farmers—is slowly but steadily making headway toward restoring the crane in the wild. Sarus Cranes were extirpated in Thailand about 50 years ago due to the triple threat of farmers, hunters, and pesticides. But now, it’s farmers who are helping to save the day. Over the past five years, dozens of the birds have been reintroduced, and in deference, farmers are idling their tractors and going organic. Those measures have just paid off: The first wild-born Sarus Crane in Thailand since the 1960s just celebrated its one-month birthday. (Experts have named it—what else?—Rice.) Though these cranes have a long way to go toward reestablishing themselves in the country, a new life is always a promising and hopeful start. Dancing Crane photo courtesy of the International Crane Foundation. Inspiring–reminds me of the recovery that sandhill cranes have made across North America.